Virtual Box 5.0 in Portage! I guess just in time for Windows 10??? Checking for environment: Determined build machine: linux.amd64, target machine: linux.amd64, OK. Checking for kBuild: found, OK. Checking for gcc: found version 4.8.4, OK.
** Open Watcom was not found! Checking for iasl: found version 20130117, OK. Checking for xslt: found, OK. Checking for Open Watcom: found version 1.9, OK.
Also had to “emerge -v virtualbox-extpack-oracle app-emulation/virtualbox-additions” separately. 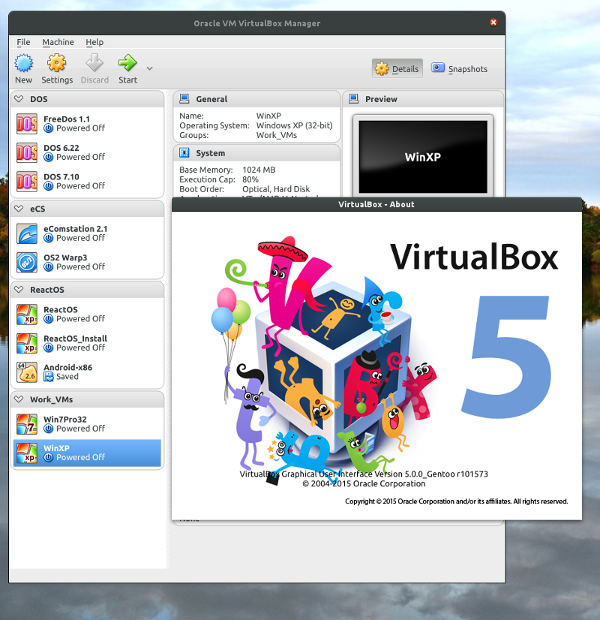 This entry was posted in Gentoo, Open Watcom, Virtual Box and tagged gentoo, virtual box on July 14, 2015 by mgreene. This entry was posted in Open Watcom, OS/2, programming on July 18, 2007 by mgreene. Added a Open Watcom eCS-OS/2 setvars.cmd page. I had to change setvars to add perl statements for building nasm. This entry was posted in Open Watcom, programming on May 26, 2007 by mgreene.